The New Way to Shop for Movies… Marketing is Strange. Walking into Target, taking a photo of the new releases and then using that consultation photo to assist me in renting the new releases on Amazon on demand for $5 streamed right to my TV. The laziest and best way to double-check the best movies to rent! It’s a totally lazy way to run my media viewing and it works pretty darn well. Try it! You completely avoid bending over to put the disc in too! 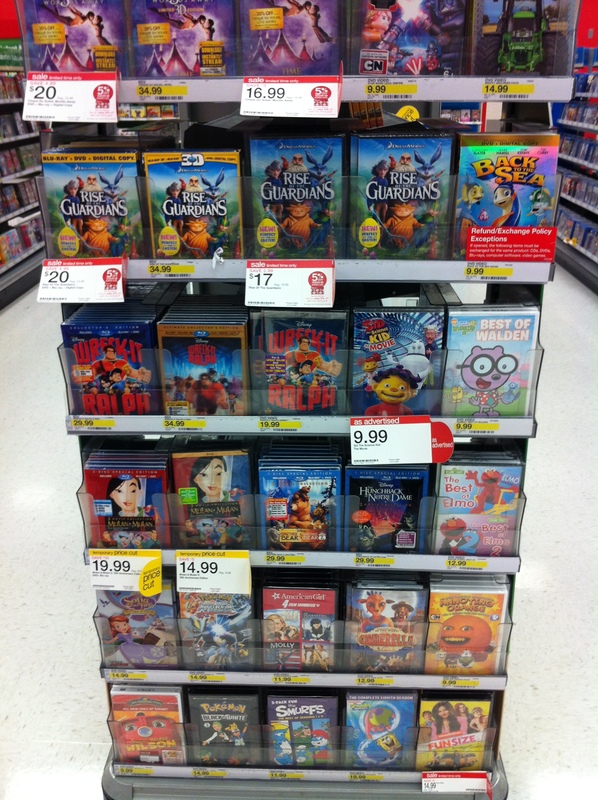 Just take a pic of the new releases when you’re in Target for other reasons. Head home and then look a few of them up on your Amazon on demand setup. I feel like I save $10 each time I rent a movie. Setup: I use a ROKU box and because I am an Amazon Prime member, I have the Amazon channel setup along with Netflix (on demand only). So, in full disclaimer, I have purchased hundreds of videos and DVD’s in the past and witnessed as the value went from $20 per to the garage sale value of $1. per DVD. I’m done buying physical media. In the past I HAD to own it. Not anymore.